Los Angeles City Councilmember Jose Huizar read the following statement regarding Parker Center at the meeting of the Planning and Land Use Management Committee on Feb. 8. Huizar, who is chair of PLUM, became emotional, stopping momentarily during his prepared remarks. I want to thank everyone in attendance today. The last time we heard this item was in 2015. At that time, council lost jurisdiction and was unable to act. But I did request at that time that we revisit an EIR (environmental impact report) that had been prepared for the site, in order to fully exhaust all possibilities related to preservation or expansion.I also directed that work begin on a Civic Center Master Plan, to which I have long been committed. 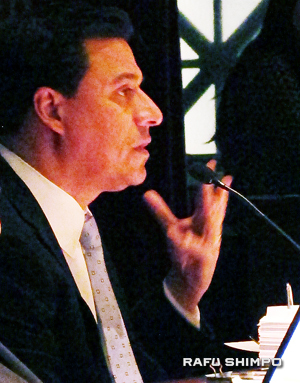 Councilmember Jose Huizar speaks at PLUM Hearing on Parker Center on Feb. 8. (MARIO G. REYES/Rafu Shimpo)has been completed and presented to Entertainment and Facilities Committee, where it is still under consideration. That plan has been completed and presented to Entertainment and Facilities Committee, where it is still under consideration. I want to acknowledge all of the stakeholders in the room. I believe this committee recognizes why this is such an important conversation for many people. The Parker Center is a notable space, for multiple reasons. It is also a chapter of a larger story. We have a natural tendency toward a revisionist history. In Los Angeles in particular, it can seem like we are so quick to destroy what limited history we have built up over the last 75 or 100 years. But there is always more to the story. The story of Parker Center has often glossed over the fact that it was not the first structure on this plot of land. In fact, this block was once the center of daily life and business activity for the Japanese American community. The block was privately owned until the late 1940s. It was occupied by homes and businesses, an original part of the Little Tokyo community. The original headquarters of the Rafu Shimpo newspaper was on that site. The residents and shop owners were forcibly removed during World War II, as they were sent off to internment camps in what is one of our most shameful moments in American history — a humiliating and degrading experience to people who were American citizens. Not long after they returned from the camps, and had begun slowly and painstakingly rebuilding their community, the City of Los Angeles acquired the property by eminent domain. The entire block of homes and businesses were completely razed to make room for expansion of city facilities. Parker Center not only erased an important part of Little Tokyo’s history, in its design, it turned its back on what remained of Little Tokyo. And in practical terms, it does little to facilitate activity and accessibility to the spaces and resources at City Hall. It serves as a blockade. The building does embody an important story about the history of policing in Los Angeles. As Historic Resources has noted, its construction was seen as a symbolic move for the LAPD. It created an ambitious modern container for an agency that wanted to modernize and become more efficient. The building may have helped the department modernize, but it was at a cost: The subsequent decades at the LAPD provided us with case studies of police efficiency and pro-activeness — but also in some instances, abuse of power, cruelty, and racism in policing. This building epitomizes the Parker era. It also epitomizes an unfortunate and myopic relationship to its other stakeholders: including, but not limited to, the long-time members of the Little Tokyo community. Architecturally, we can recognize that it was built by a master architect. I understand this, I am a preservationist. I believe buildings hold important stories, they are repositories of public memory. But many would say it is not an especially unusual example of Welton Beckett’s work. It is not reflective of the designer’s broader contribution to L.A., which we have well-preserved in other buildings like the Capitol Records Building and the Dorothy Chandler Pavilion. We also have more significant and noble specimens of Mid-century institutional architecture. To call this building a masterpiece specimen of Mid-century architecture, and to retain its landmark status with the Parker name, is to further the revisionist history that dismisses the injustices done to many communities, including Little Tokyo. I believe we can do justice to these histories, and better tell the story of the building and its relationship to policing, without spending millions of public dollars just to freeze the building in time. We can get to a partial preservation of a different, but extremely significant kind if we are mindful. Our precious resources can better be spent on a careful, thoughtful preservation of certain elements — such as the murals, public art and other architectural features — without needing to rehabilitate obsolete offices. Our communities, our workers and our city deserve truly modern, efficient, useful and livable upgrades. However, we must make every effort to ensure that the “Theme Mural of Los Angeles” by Joseph Young and “The Family Group” bronze sculpture by Bernard J. Rosenthal are integrated into the design of any new buildings that go on the site. Additionally, as we’ve heard from staff, the preservation option would require the city to absorb exorbitant costs. The Civic Center Master Plan that I called for also was tasked with analyzing financial strategies to make the build-out feasible. I don’t see that the preservation path is consistent with our fiscal realities.